Michigan senior Lauren Blanchard, left, and freshman Erica Decker, right, lean in as junior Hadas Brown reads a breaking news message on her cell phone before they do a taping of their show on University of Michigan student TV station WOLV. Student-run television station WOLV at the University of Michigan might be one of the U-M’s best-kept secrets, but that could be about to change. “We are quite unknown, but we are fixing that this year,” Director Lauren Blanchard said. AnnArbor.com caught up with WOLV at its studio on the top floor of South Quad recently while the students were producing the show “Wake Up With WOLV,” a mix of news and features broadcast live on campus every Friday morning at 11 a.m. Archived shows are also available online. The station not only provides a service to U-M students, it also serves as a training ground for those seeking careers in broadcasting. “We’re under two decades old and we’re still getting the name out there on campus,” added Hadas Brown, who is currently serving as publicity director but who will share general manager duties with another student, Margaux Sax, in the fall. “We’re really trying to expand our online presence because we know that through the use of social media, that’s how people find things out now,” Brown said. Part of that process means reaching out to other groups, including student government, public affairs and the Department of Public Safety. “We really try to embrace the relationship with student government to try to get stories from them. I think we’ve done a lot by bridging communications with student organizations here,” said Brown. Michigan junior Katie Korinek and freshman Erica Decker operate the cameras as they prepare for a taping of their show on WOLV. Founded in 1994 by three students, WOLV-TV has evolved from covering Michigan ice hockey games to producing 10 different shows—including news and entertainment—and has partnered with the Big Ten Network to live-broadcast a range of Michigan sports. “We’re still pretty new. When you think of other groups that have been around since the university started, we are still a baby,” acknowledged Lauracindy Plague, news director. “Everything is sort of trial and error. We operate by the motto ‘students teaching students,’ Brown said. Not only do the students anchor shows, they learn how to produce and edit, how to run the cameras and even haul them around as necessary. 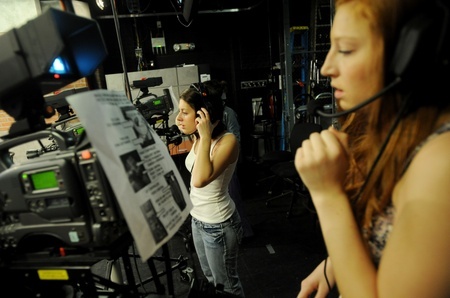 Given the level of commitment in front of the camera and behind the scenes it takes to keep a project such as WOLV-TV running, it comes as no surprise to hear that most of the students involved in the station, many of whom have already done internships in the field, plan to seek careers in broadcasting. Some WOLV-TV alumni are already working in the industry and say the station provided an invaluable training ground. Jake Serwer, a U-M 2009 graduate, said the experience he gained at WOLV has proved priceless in his current job as television producer and assistant to Chris Wallace, host of "Fox News Sunday" in Washington, DC. “For me, WOLV-TV was like a grad school program in journalism ... only it was free,” he wrote in an e-mail. “WOLV-TV gave me the confidence that I could take an idea of mine from scratch and make something happen. I made my career happen from everything I did at WOLV-TV and the people and stories I covered in Ann Arbor. “At some point in life we all have an ‘aha’ moment where we find something that we love to do, and for me, WOLV-TV started it all,” Serwer added. Billy Holbert, a 2010 U-M graduate who now works as a news assistant for CNN in Washington, DC, counts his WOLV experience as equally helpful. “WOLV was the only place on campus where you could get a hands-on learning experience in broadcast journalism and television production outside of the classroom,” he said. Some of WOLV-TV’s biggest challenges, besides visibility, are limited space and aging equipment. Brown said she and the others are looking forward to the day when they can give back to the student station that helped give them their start. “We plan to leave, get those couple of first paychecks, give a little gift to WOLV,” she explained. Mon, Apr 9, 2012 : 3:25 p.m. Thanks, Roger, for giving these talented students some publicity. I'm a former Detroit Free Press staffer who teams with another local reporter to teach an environmental journalism course at UM. It's clear that visual storytelling is an increasingly important mode of communication. Although our education system focuses on writing, the ability to communicate visually is a skill that will give these WOLV-TV students an edge, whether they go into broadcasting or just about any other field. By the way, one of our students this term is Lauren Blanchard, WOLV-TV's director. Great article, Roger! Thanks to WOLV, I was able to get me feet wet in TV, and now I'm on a reality TV show in Chicago! (http://www.StepItUpwithSteph.com) What a great article!